To sum up the entire tobacco industry you only need to read this one quote from Warren Buffett: “I’ll tell you why I like the cigarette business. It cost a penny to make. Sell it for a dollar. It’s addictive. And there’s a fantastic brand loyalty.” Those five sentences pretty much encapsulate one of the most profitable industries in history. It’s candid, particularly in the context of addiction, but if you’re looking for what makes a wide-moat business then this describes it perfectly. Turn the clock back 65 years to 1941. The United States was on the verge of entering the fray in WWII, a conflict which would ultimately see millions of US troops deployed across the globe. Alongside their basic food rations were common sense accessories: very basic cutlery, a can opener, a few sheets of toilet roll and so on. Each troop was also entitled to nine cigarettes. Such was the importance of tobacco to troop morale that service personal were given free cigarettes and a book of matches as standard issue. The tradition lasted up to and including the Vietnam war, stopping once the weight of research into the health effects of smoking became too large to ignore. Not only that but the issued cigarettes were not just any old generics, but a selection from brands such as Camel, Player’s, Lucky Strike and Chesterfield. This is the importance of branding power. Us non-smokers probably won’t get it, much in the same way that someone who doesn’t drink soda won’t get the difference between an ice-cold Coca-Cola, drank from a glass bottle, and a generic cola from a tin can. These days there are six big, global stocks that cover the lion’s share of the tobacco market: Altria, Philip Morris International, British American Tobacco, Reynolds American, Imperial Brands and Japan Tobacco. I’ll start off by taking a look at the two FTSE 100 stocks: Imperial Brands and British American Tobacco. It says a lot that despite the onslaught of regulation, health warnings and high taxes on tobacco products that a stock like Imperial Brands (LON: IMB) can still post net margins in the region of 30% along with double digit returns on invested capital. The investing landscape facing Imperial over the last twenty or so years has been characterized by stigma, lawsuits and ever increasing tobacco regulation, to the point where an investment a couple of decades ago might have been considered uncertain given the aforementioned headwinds facing the industry. The company provide dividend information going back to 1997 which gives us about twenty years worth of figures to look at. What would have an investment in Imperial Brands looked like over that time? Back then a share of Imperial Tobacco as the company was then called was going on the market for about £3. Your 1997 dividend payment would have totaled 21.4p, giving you a yield of about 7%. Now, in today’s environment that looks like amazing value. Bear in mind though that “risk free” 10-year UK government debt was also trading at a 7% yield back then compared to today’s 1.6% yield. Even a cash savings account would likely have fetched a similar yield to Imperial Tobacco stock for almost zero risk; today you wouldn’t even get close to 2%. The long-term outlook for tobacco in general was poor, advertisements were on the way to being completely banned and the health effects of smoking were fully known. Despite the bleak outlook Imperial Tobacco has been able to lavish its shareholders with relative riches in the two decades since. Cumulatively the company has returned over £12.50 in dividend payments alone for each share purchased in 1997. That’s over four times the initial investment total. 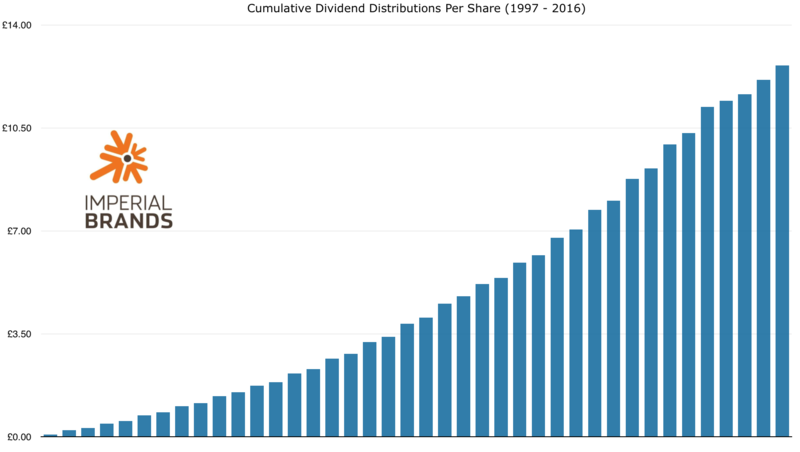 Each year, on average, you would have received an 11% increase in your dividend distribution. That’s for doing absolutely nothing at all. The share price has gone from £3 then, to over £37 today. That equates to a 14% compounded annual growth rate. In spite of everything that has been thrown at the tobacco industry it remains an incredible profit making machine. A £15,000 investment back in 1997 would have fetched 5,000 shares of Imperial Tobacco. Today, those shares would be throwing off a tad over £7,000 each year in dividend income. The total dividends received to date would amount to about £63,000. In addition the £15,000 starting capital would have grown to a total value of £185,000 today. If you dive into the annual accounts then the reason for such incredible returns over the past twenty years becomes a bit clearer. The 1997 annual report indicated that Imperial Tobacco had earnings per-share of just over 40p. So the 1997 share price was trading at well under 10x full year earnings per-share; today the stock is going for about 15x expected 2016 earnings of 238p. In other words the returns have benefited from healthy expansion of the earnings multiple. Remember the pricing power that Buffett mentioned in the quote at the top of the page? That’s a strong boost to earnings in an era where tobacco sales volumes are unlikely to be showing significant growth. Each year the company is able to raise the unit price on their brands whilst retaining customers, such is the strength of their products. The future will undoubtedly involve more of the same headwinds that tobacco investors have already experienced. A move towards mandatory plain packaging for example would almost certainly deliver a brutal blow to big tobacco’s branding power. Smoking rates will probably continue to show declines as each generation passes. The underlying business remains so incredibly cash generative though that, even with all the negativity, you wouldn’t be in a rush to bet against a stock like Imperial Brands. A stock that, once the numbers are crunched, can still churn out 90% free cash flow conversion from operating cash flow. Tobacco will continue it’s slow decline, but it will be a lucrative one at that.